The 2008–2009 ADAA Collectors’ Forum series begins with “The Global Economy and the Art Market: A New Perspective in Uncertain Times.” This forum will bring together art market specialists and key players to discuss the current economic outlook and its impact on the future direction of the art market. Panelists will address questions such as: Was there an art market bubble, and has it burst? Who will benefit from the current conditions and who will suffer? How can art professionals prepare for what might be ahead? What lessons can be learned from past cycles and how are these times different? Collection of The Butler Institute of American Art, Youngstown, Ohio. Museum purchase, 1954. 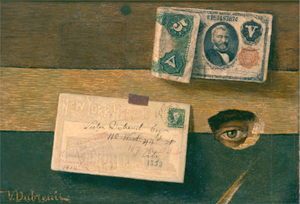 Victor Dubreuil, The Eye of the Artist, circa 1898, oil on canvas. Art Advisor, M.G. Hoeveler Ltd.